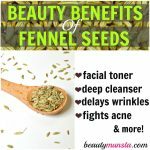 Top 10 Beauty Benefits of Strawberry Seed Oil - beautymunsta - free natural beauty hacks and more! Strawberry seed oil is truly as cute and fun as it sounds! 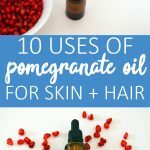 Find out the numerous beauty benefits of strawberry seed oil and why you should add this oil to your beauty collection. 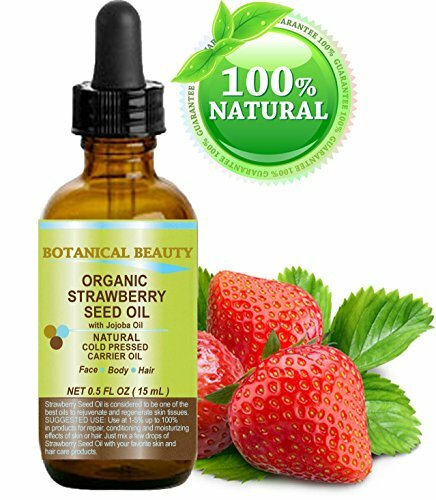 What Is Strawberry Seed Oil? Strawberry seed oil was first mentioned in ancient Roman literature as a medicinal agent. The word strawberry, in fact, originates from the old English word, “streawberige” meaning runners that look like strays of straw. Since the strawberry fruit has been cultivated for thousands of years, the oil was obtained from its seeds and used either as an ingredient for manufacturing essence or for beauty purposes. The oil has some pretty amazing properties. It is rich in compounds like Biotin, Folic acid, Ellagic acid, Vitamins B5, B6 and C and minerals like manganese, copper and magnesium. Now it’s time to check out some of the main beauty benefits of strawberry seed oil! Being rich in antioxidants, strawberry seed oil fights free radicals to prevent them from damaging skin cells. This results in minimizing dark patches, age spots, freckles and wrinkles. Simultaneously, it helps lighten the skin complexion. Applying plain strawberry juice on the skin also achieves good results. Strawberry seed oil possesses some great cleansing properties and is used widely as an ingredient in manufacturing face washes, skin cleansers, skin rejuvenating face masks and bubble baths. The oil is rich in salicylic acid, vitamin C, exfoliants and antioxidants. The salicylic acid eliminates the dead skin cells while tightening skin pores also. The ellagic acid present in the oil is a powerful antioxidant and effectively combats skin damage by protecting the skin from free radicals, making the skin smooth and soft. An ice cold mixture of strawberry seed oil mixed with fresh strawberry juice and rose water works as an excellent skin toner when applied directly on the skin. 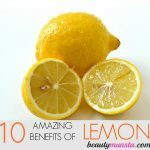 It eliminates wrinkles and blemishes, leaving the skin looking younger. The Alpha Hydroxy Acids, Vitamin C, salicylic acid and flavonoids present in the oil fight acne and also control excessive skin oil production. 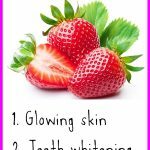 Two teaspoons of strawberry seed oil mixed with a mash of eight strawberries and one tablespoon of milk may be applied to the face and rinsed off with water after about 15 minutes. This treatment is mot effective if done twice weekly. Strawberry seed oil slows down skin ageing, which is usually caused by unstable ions that form in our body when food is oxidized into energy. Its high vitamin C and Ellagic acid content fights these free radicals, stabilizing such unstable ions, preventing them from damaging our body’s cells. Mix two teaspoons of pure cream, one teaspoon of honey and one teaspoon of strawberry seed oil and apply the pack to your face and neck. Leave it top dry for 20 minutes, washing off with water. Regular use will minimize wrinkles and fine lines, leaving the skin supple and soft. The ellagic acid present in strawberry seed oil protects the skin from harmful solar UV rays. Direct application of the oil cures light dermal hyperpigmentation, a condition caused by UV rays inhibiting melanin synthesis, which is responsible for skin color. The astringent qualities of strawberry seed oil successfully reduce under-eye dark circles and puffiness. Rub a few drops of the oil under your eyes before bedtime till it dries. Then wash your face with cold water and apply some moisturizer on the area. Sleep in a cool place to relax the eye muscles. Keep repeating the treatment till the dark circles disappear. Strawberry seed oil mixed with a few drops of glycerin and two tablespoons of grounded oats acts as an excellent treatment for cracked feet. After soaking your feet in lukewarm water for about ten minutes, gently scrub the affected areas with the mixture. It removes the heel’s dead skin cells, making your feet soft and crack-free. Strawberry seed oil’s exfoliating properties remove the dead skin cells from our lips, thus preventing dryness. 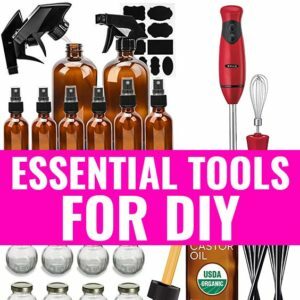 A regular rub with a few drops of the oil and rinsing it off with lukewarm water will give you the best results if done regularly. It will also reduce lip darkening. One tablespoon of strawberry seed oil and two tablespoons of petroleum jelly may be mixed and used as a balm twice or thrice daily. The vitamin C and malic acid in strawberry seed oil breaks down dental plaque, to give our teeth a pearly white look. Take two to three tablespoons of the oil ad mix with two freshly crushed strawberries to make a paste. Brush your teeth with it for a few minutes and rinse off with warm water. Best done twice daily for about four weeks to get results. 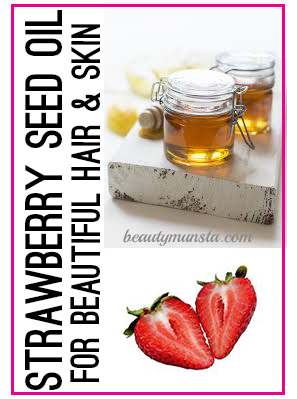 What are your favorite beauty benefits of strawberry seed oil? Share in the comments below! 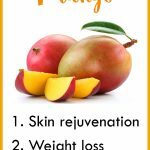 5 Beauty Benefits of Mango for a Prettier YOU!